Get your frying pans at the ready for some fun, flipping pancake action this Shrove Tuesday (28th). Families across the land will be cooking up a storm in the kitchen and creating some wonderful pancake delights – although a few may end up on the ceiling! If you normally just stick with the classic pancake with lemon and sugar, why not get a little more adventurous with some alternative fillings or toppings. Make a fruity sauce with our Summer Fruits by warming them up in a pan, and adding a little water, sweetener and cornflour. Blitz some frozen field fare strawberries in a blender adding a little finely grated lime rind. 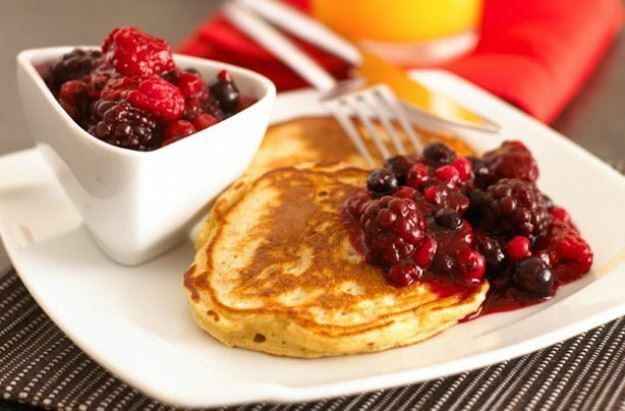 Add some Greek Style yogurt to your pancakes with defrosted field fare raspberries and blueberries & fold in half. Sprinkle with a little icing sugar and a drizzle over your Strawberry sauce. Pancakes with a drizzle of honey and field fare defrosted berries. Simple, yet delicious. So have a cracking good time, whisking up some delicious fruity pancakes that will be difficult to resist! !